Many would argue this is more of an RDTA than an RTA or like CoilArt phrased, a GTA or Genesis Tank Atomizer. The deck sits in the middle of the 2.5ml tank (not the largest juice capacity). The added feature of spring-loaded deck clamps make this a very easy atty to build. They clamp down great and the gold plating offers some great conductivity. The top cap is hard to grab a hold of and needs some knurling or larger surface area to aid in getting a nice grip on it to screw off for top filling. 810 drip tip compatibility is nice and the included tip is great, the added 510 tip adapter is great too (two features lacking in the GTA). Overall it’s a pretty clean aesthetic, other than the odd CP24 engraved branding on the barrel section. A conical chimney and condensed chamber are defiantly aiding in the flavour quality of the CP24. Flavour is good, maybe on par with the GTA. Wicking plays a major role here, you need to get it right so the juice saturation is high. Get it right and the flavour should keep most happy. This atty is definitely bordering on more of a Cloudchaser than flavour atty. Vapor production is very good, we just wish for a bit more flavour density. Airflow is on the smooth side but a little loud for our liking. No whistling, just volume. The AFC does it’s job, but just like the top cap there isn’t a ton of surface area and a lack of knurling, so adjustments can be a little challenging at times. We like it closed down 2/3 or more for best flavour. Building is a treat, when these spring-loaded clamp decks work, they work. Dropping a coil in and clamping down is extremely easy and the clamps work great. There are nice little ledges to keep the coil leads situated perfectly. It’s a great design and is the best overall feature of this atty. The wicking channels are nice and wide and easy to fill, there is definitely something to this mid tank deck design, the vacuum it creates makes it almost impossible to leak. We found trimming down your primed wick leads to fit the circumference of the barrel threads to give the best wicking performance. As for coil/build recommendations, claptons all the way. 2.5-3mm in around 0.3-0.6 do well. We like the added easy of getting the wicking right that a 2.5mm coil offers. It’s an airy atty, power is going to help with this one, so build accordingly. Juice capacity isn’t great, 2.5ml for a rather tall, 24mm tank leaves something to be desired but a tank full lasts a couple of hours. Filling can be a pain when trying to get that top cap off, but once it is the juice ports are nice and large and we haven’t had any leaking. Removing the o-ring under the top cap seems to help things quite a bit (a lot less tension on the threads). 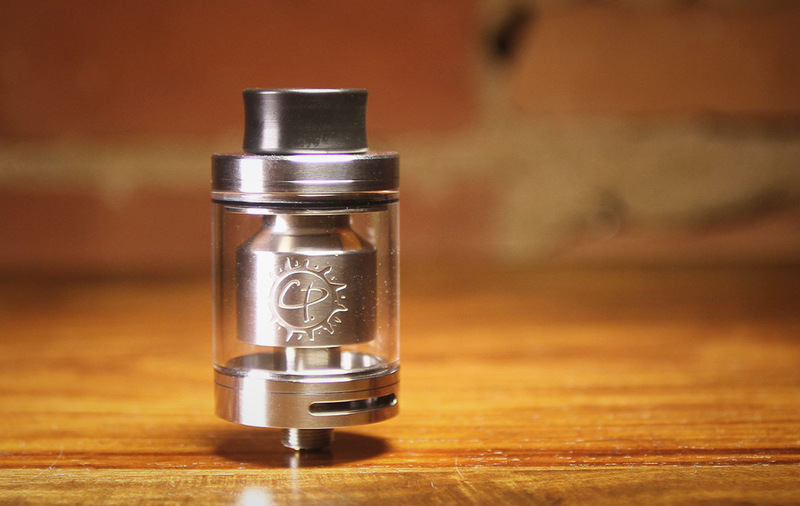 The Advken CP24 is a decent tank at a fair price that offers some pretty good flavour. Might be more of a tank for a Cloudchucker looking for more flavour or maybe a Flavourchaser looking for some more Clouds. For the price it’s worth playing with. Maybe just not the most original design thinking going on here that is getting to us. Decent.